Talk about the Comeback Kid. After Comet C/2012 S1 ISON rounded the sun yesterday afternoon, professional astronomers around the world looked at the faded debris and concluded it was an “ex-comet.” NASA wrapped up an hours-long Google+ Hangout with that news. The European Space Agency declared it was dead on Twitter. But the remnants — or whatever ISON is now — kept brightening and brightening and brightening in images from the NASA/European Space Agency Solar and Heliospheric Observatory. The pictures are still puzzling astronomers right now, almost a day after ISON’s closest encounter with the sun. “Matthew [Knight] and I are ripping our hair out right now as we know that so many people in the public, the media and in science teams want to know what’s happened. We’d love to know that too! Right now, here’s our working hypothesis: As comet ISON plunged towards to the Sun, it began to fall apart, losing not giant fragments but at least a lot of reasonably sized chunks. There’s evidence of very large dust in the form of that long thin tail we saw in the LASCO C2 images. Then, as ISON plunged through the corona, it continued to fall apart and vaporize, and lost its coma and tail completely just like Lovejoy did in 2011. (We have our theories as to why it didn’t show up in the SDO images but that’s not our story to tell – the SDO team will do that.) Then, what emerged from the Sun was a small but perhaps somewhat coherent nucleus, that has resumed emitting dust and gas for at least the time being. In essence, the tail is growing back, as Lovejoy’s did. This morning (EST), Battams succinctly summarized the latest images he saw: “Based on a few more hours of data, comet #ISON appears to be… well, behaving like a comet!”, he wrote on Twitter. NASA issued a status update this morning saying it’s unclear if this leftover is debris or an actual nucleus, but added that “late-night analysis from scientists with NASA’s Comet ISON Observing Campaign suggest that there is at least a small nucleus intact.” NASA, as well as Battams, pointed out that comet has behaved unpredictably throughout the 15 months scientists and amateurs have been observing it. For those keeping score at home, it got bright, then it faded, then it got all smeared out, then it came around the Sun smeared out, and then it seemed to get its act together again. At this point, I refuse to make any further conclusions about this comet; it seems eager to confuse. I’ve been hearing from comet specialists who are just as baffled… which is fantastic! If we knew what was going on, there’d be nothing more to learn. From my initial look at ISON in today’s SOHO images, it seems nucleus has mostly disintegrated. Will only know if part of ISON nucleus has survived by continuing observations and performing more analysis. Bright fan-shape implies lots of material was released and travelling along ISON orbit, not confined in a traditional tail. Would be interesting to learn more about composition of debris to help us piece together what’s happened, but we need more time. Other spacecraft searching for ISON were not able to spot it. 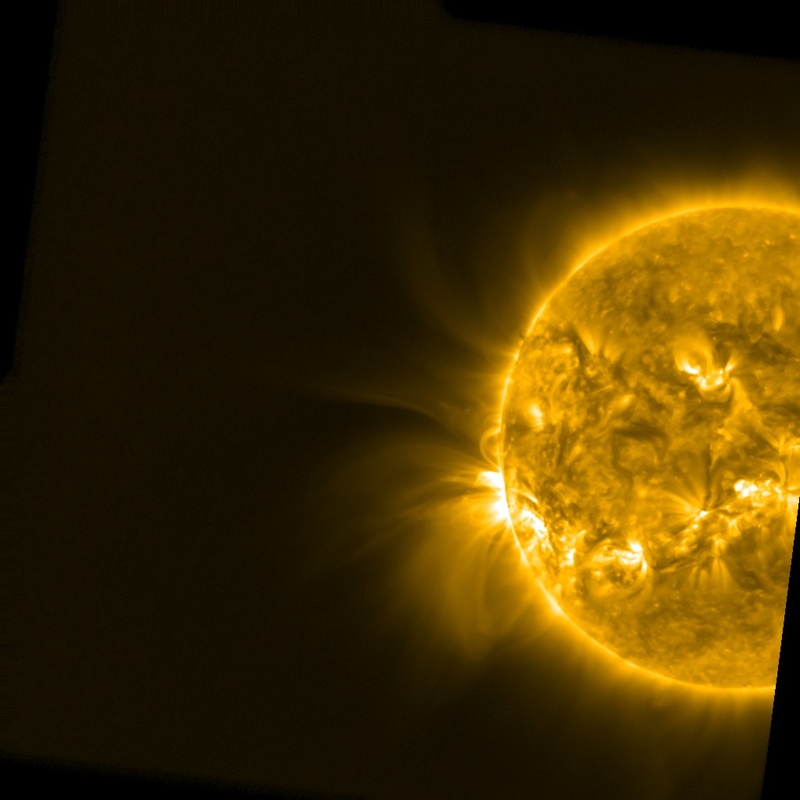 For ESA’s PROBA-2, it may have been because of its composition or proximity to the sun, but scientists are unsure. It was also invisible in NASA’s Solar Dynamics Observatory; “scientists are still looking at the data to figure out why,” an agency Twitter update stated this morning. So to sum up: no one’s quite sure of what is happening now, or what is happening next, but we will keep you posted and let you know if and when you can see ISON again in your home telescopes. He’s back!!! Our pal Phil Plait the Bad Astronomer is back again on the Discovery Channel with the second episode of his new series, “Bad Universe.” It is on TONIGHT (October 6), so check your local listings here, and you can also find when it will be replayed in case you miss it. Above is a teaser/trailer of the second episode where Phil flies in an F-16 — it’s awesome! Just how much punishment can Phil’s frail, pale, scientist body take? Find out! Can’t get enough? More videos are available on the Discovery Channel’s main Bad Universe video list. And by the way, Bad Universe will be shown immediately following Mythbusters this evening. We’ve hinted that it was going to be made, and then we warned you that a sneak preview would be aired on August 29th. Well, now I’ve seen the first episode of Phil Plait’s Bad Universe, and I’m here to solemnly judge it.